It was recently my birthday so I decided to treat myself to some paper crafting tools. 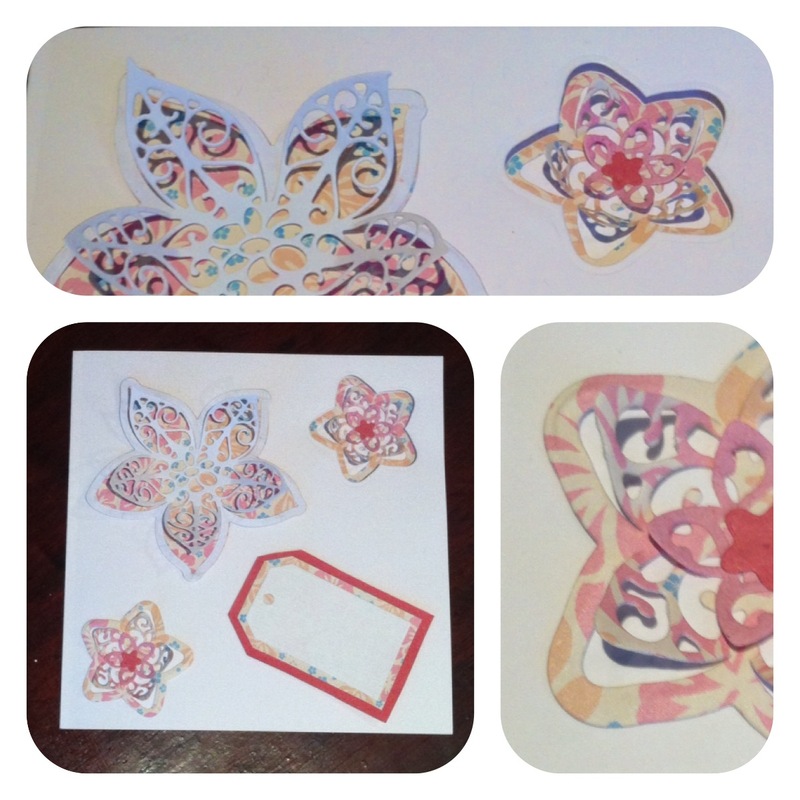 I bought a Cuttlebug embossing and die cutting machine, a stars embossing folder and a couple of Tattered Lace die sets (flower and butterfly). Glad you asked. So, I’m not as far forward on the book as I thought I would be at the start of my writing adventure but I think I have made a pretty good start for someone who has never written so much in one go before. I am approximately 11,ooo words in and have realised that some sort of in chapter format would be helpful to arrange my thoughts and to give a reasonable start and end to each chapter. I’m now back at work so my time has become limited again which means I need to set myself some more deadlines to keep this book train moving. This weekend I will give it another good go and see where I end up. I was initially trying to review as I went and soon realised to get continuity and flow, it would be better to get everything down in a first draft and then look at the whole. This would also mean that I could pick the best chapters, discard the weakest ones and then review with a consistent tone and approach. So the most important thing for me at this phase is to keep writing. Also I have found that when you force yourself to write you lose a bit of the relaxed and funny side of your writing so I have been trying to avoid this as the book needs to b light-hearted and fun. Let’s get ready for Halloween…. Ok, so, Halloween is a little way off yet but as I am usually the wizard of last-minute organisational wonders (ok chaos at times) I decided to break the mould this week and plan for Halloween. I know this really is a scary thought!! Week 41 enter at your own risk… MWUHAHAHAHA. Last year was a complete disaster resulting in an evening with the lights switched off, earphones in, blinds closed and the battery being removed from the doorbell – I know extreme but also very embarrassing, however, the trauma obviously still set in my mind I set to work organising a Halloween tea. I designed an invite which in my opinion was a fair attempt in the time I had to rustle one up and emailed it round close family and friends. I’m a bit of a perfectionist at times so to create something quick and get it out there was another big step for me. My costume has been ordered and if you have read my previous post ‘Investments, Networking and a Witch’* I took my inspiration from a character I played once at school. so for Halloween Matthew** I am going to be………… a witch! There are actually loads of ideas out there for Halloween but I’m not going to sit here and tell you what you could do if you are holding our own party, however, for any party you need good food, good company, a bit of fun and an element of surprise – so that is what I am working on achieving! Hope you have fun too on Halloween (if you celebrate it) and remember make sure you (and your kids) stay safe when Trick or Treating and if someone hasn’t got anything in their windows to show they are celebrating Halloween, save them the embarrassment and don’t knock! ** This is a reference from a UK show, Stars in their Eyes, presented by Matthew Kelly where members of the public who sang like well-known popstars would be made up to look like their popstar hero and appear through a smoke-filled doorway revealing their transformation. They would then battle it out with others to be crowned sing-a-like of the year – or something. The winners would then go on to have a glittering career performing in pubs, clubs and on cruise ships, forever trapped in the body of their popstar icon. Oh wooh wooh six pack…. The last two weeks have been soooo busy at work, time constraints have meant that the exercise plan has gone on the back burner. Some say the sky’s the limit, I say it’s just the beginning of the journey! …..Week 36 has been a tough one. And when I say tough I mean tough purely in a work context, with very challenging deadlines. The result of this challenging week is a weekend feeling rather tired and if I’m honest a little down. Energy levels are low and any inclination to do anything today has been severely compromised. I enjoy having moments of quiet contemplation, sitting and just thinking (and I am a great thinker – not of great thoughts, well maybe I have the odd one, but of thinking, a lot). It helps to reflect on and appreciate personal growth, which passed you by whilst you were experiencing it. – be firmer about what I want and how I want it. I have found that it’s important to have your own opinion (which is different from being opinionated), that you need to drive your own personal goals (which are separate from any Company’s), networking is one of your keys to success and it is unlikely you will get all the experience you need from one place so look out for volunteering opportunities which add to your skill set and get involved in projects which provide diversified and varied experiences. Your long-term goal will be made up of lots of short-term goals – stepping-stones to the end game. Some of those short-term goals will be hard to achieve and some you won’t enjoy doing, but once each one is complete it’s on to the next goal and a step closer to your ultimate goal. Here’s to short-term goals and their significance in reaching the end game, to quiet contemplation and reflection and also to having a laugh from time to time (life would be very boring otherwise).